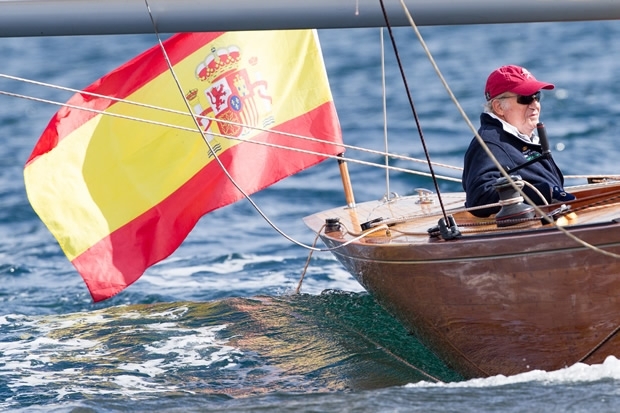 H.M. King Juan Carlos of Spain was in Sanxenxo where he took his first sail on board José Cusi’s 'new' Bribon, a classic 6mR class boat, acquired approximately a month ago in Loviissa, Finland. Bribon and her sistership Acacia have been docked in Sanxenxo since Tuesday, and the King arrived at the Royal Club Náutico on Saturday at around midday, where his fellow crew mates Pedro Campos, Alberto Viejo, Roi Álvarez, and Luis Saenz among others were awaiting him. Formerly known as Ian, the monarch’s new boat is a 6mR, which became popular between the 1920s and 1940s, and was even an Olympic class until the Helsinki Olympic Games in 1952. Roughly 500 6mR have been built over the years of which around 100 are still raced, maintained respecting their original design. Mauricio Sánchez-Bella, the owner of Acacia, the twin of the new Bribon, is the boat which His Majesty King Juan Carlos competed on in Sanxenxo last month following a seven-year absence from yacht racing. Along with José Cusí and Pedro Campos, he was one of the people to have travelled with the monarch to Finland, and explains why their chose to acquire Ian. “We were looking for a boat which was as close as possible to Acacia. Both mine and the new Bribon are by the same designer, built in the same year and at the same boatyard,” explains Sánchez-Bella. “She is an absolute gem. Fully varnished, well-maintained and reconstructed with utmost fidelity, she has a modern and really competitive sailing rig and steering system. Everyone’s reaction on seeing the boat was very positive. It was in impeccable condition, and the kind that you don't often find up for sail, so was a very attractive option." Sanxenxo on Saturday was also special because it was the first time the two sisterships had been reunited in 86 years. “After more than 80 years, to find two equal boats reunited, each which has lived a completely different life, is quite unique,” pointed out Sánchez-Bella. Following their construction in Gothenburg in 1929 at the Swedish boatyard Abrahamsson & Son, the two boats went their separate ways: one came straight to Spain, and the other stayed in northern Europe. To date, the former Ian has had approximately five owners, the same number as her twin Acacia. Its last owner was Finnish businessman Michael Cedercreutz, who owned Ian for 11 years. “In the last three years he no longer sailed, and put the boat up for sale for personal reasons. Yet when he sold it, it was with tears in his eyes, it was very emotional,” describes Sánchez-Bella.